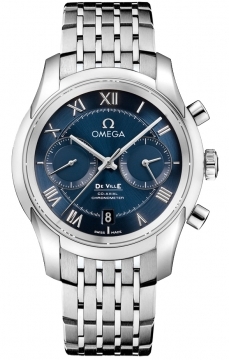 Buy this new Omega De Ville Co-Axial Chronograph 431.10.42.51.03.001 mens watch for the discount price of £5,100.00. UK Retailer. Brushed and polished stainless steel case. Stainless steel bracelet consisting of alternating brushed and polished links. 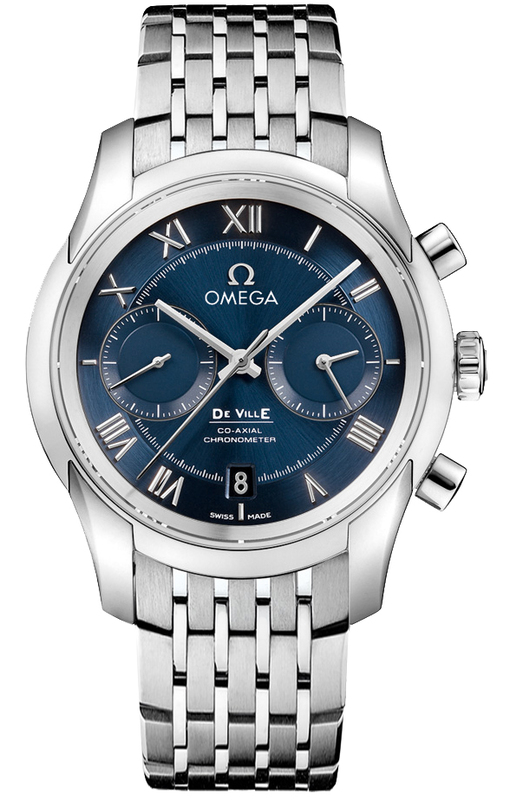 Brushed-finished blue sunray dial with applied steel Roman numerals and recessed subdials. 12-hour and 60-minute hands located in the counter at 3 o'clock. Small seconds counter displayed at the 9 o'clock position. Displays date at the 6 o'clock position. Omega Calibre 9300 movement with Co-Axial Escapement, beats at 28,800 vph, contains 54 jewels, and has an estimated power reserve of 60 hours.